Pohon Ketepeng/Ketepeng. 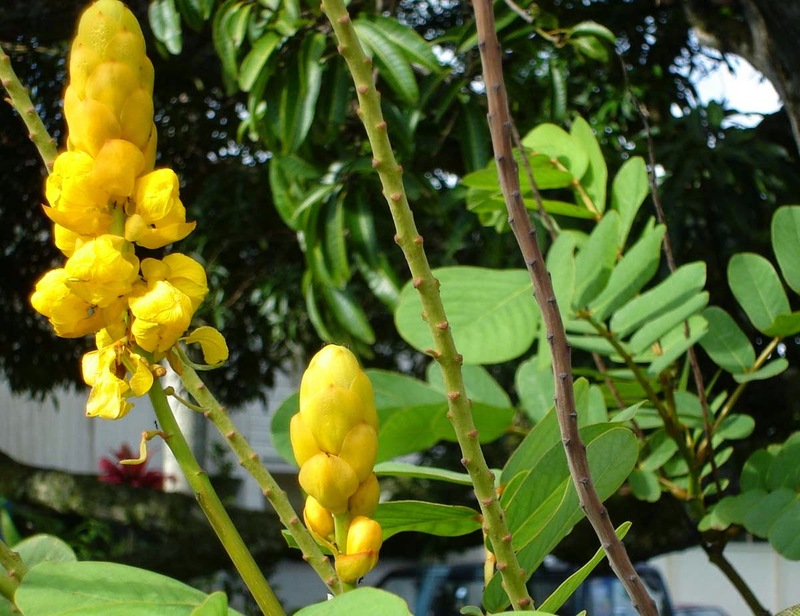 Latin name: Cassia alata L.
Habitat: 1-1400 m above sea level. Description of the plant: Plant shrubs, 1-5 feet high. Even pinnate leaves, leaves without glands axis, fulcrum leaves remain long with a wide base and a pointed tip like a red-brown skin, 6-9 mm long. 8-24 pairs of leaflets, the lowest pair located directly above the base of the petiole almost hugging twigs. Size from 3.5 to 15 cm leaflets 2.5 to 9 cm times. Unbranched flower cluster, flower stalks 10-20 cm. Protective leaves and fall short prior to bloom, the color orange size 3 × 2 cm. Petals share 5. Leaves bright yellow crown. The fruit pods are flattened, winged on both sides, splitting when ripe and the seeds can be 50-70 points. Simplesia Name: Folium alatae cassiae. Chemical Ingredients: Glycosides anthrakinon; resin; Krisofanat acid; Tanning substances; Aloe emodin. Young ketepeng 7 strands; 1 kelembak ( Rheum officinale ) root of fingers; Slightly asam fruit ( Tamarindus indica ); Water 110 ml, Made infusion, Drink 1 a day 100 ml. ketepeng leaves; whiting or a little; Little water to form a paste contused, Applied on the skin of the sick.